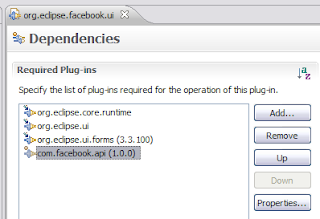 All this code does is create an embedded browser within a popup dialog and fishes for a particular authentication token from Facebook. 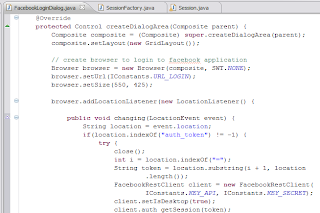 If it finds the particular token, it will create a session with Facebook, if not, it will keep the dialog open until the user properly authenticates. I was initially having trouble logging in to the service because I was stupid in how I was parsing the authentication token. I didn’t solve the problem until I enabled some tracing information. 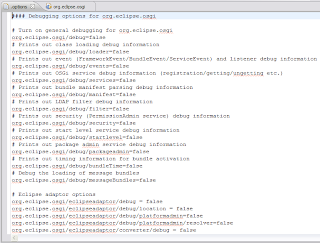 One interesting way to allow tracing for your Eclipse-based applications is to use the Platform debug facilities. 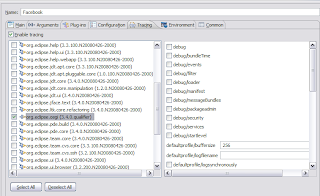 So there, now I have a simple little framework to enable configurable tracing within my Eclipse-based applications. That’s it for Part 2. 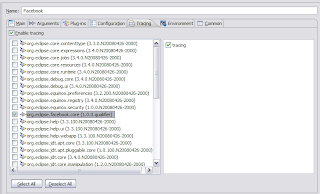 In Part 3, we will cover things like separating core code from user interface code, Eclipse Forms and amongst whatever else pops up in my head.